Meanwhile, the list of developers exhibiting an interest in building luxury high-rise accommodation on the southwest coast of the island is growing bigger. In Paphos, according to a list recently published by the municipality, apart from Aristo Developers who applied for two separate projects consisting of three high-rises, Pafilia Cyprus Property Developers Ltd has also applied for a 12-storey high rise in Kato Paphos. Korantina Homes known for its investments in the municipality of Peyia is awaiting the green light for an investment which includes two high-rises of 16 and 20-storeys in the city centre. The investment is a co-venture with Russian firm Meridoro Ltd.
CC Pearls Homes Co Ltd also plans to build two 13 and 10-storey buildings, while Prospecta Developers Ltd is also planning a 20-storey high-rise. 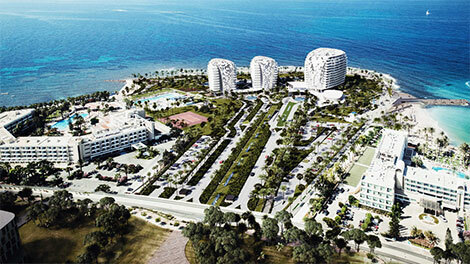 In Limassol, already well-established players are leading the high-rise construction sector. Leptos Estates are planning to build two towers of 29 and 35-storeys. Pafilia Limassol Neo, subsidiary of Pafilia Cyprus Property Developers Ltd, plans to build four towers of 43, 38, 31 and 25-storeys. Lanitis Group of companies in cooperation with Cybarco are building the Trilogy Limassol Seafront, which will consist of three towers on the city’s coastal road (on 28 October Avenue), with the tallest one being 37-stories high. Wow! It looks as though the Municipal Beach of Geriskipou will remain so if that is the case I suppose progress must be accepted. What about the danger of lunatics in power boats? Well well, might’ve guessed any land belonging to the robed-one would get the green light. If I lived there (and was a couple of decades younger) I’d be fuming, and arranging like-minded groups for sit-ins to stop the bulldozers. The decade 2010-20 seems to have been the Decade of Marinas – and still the development plans continue. Casino(s), more Marinas, be interesting to see the Cyprus Long-Term Strategic Plan for all this. The hell that is Miami beach comes to Cyprus and the tourists will leave. You have a beautiful island, why do you want to spoil it, oh! I know cash and corruption! Just how many Marinas can the island support? Rich man’s playground with the accompanying costs and price increases. Cyprus is changing for ever now.